Study as a proof of principles “Why did you go to Kenya with cassava?” asked a Ghanian early career scientist from the audience during discussion, regarding a study about introduction of high β-carotene containing yellow cassava in Kenya. In fact, the Vitamin A deficiency of the population in Ghana would be much higher than in Kenya, he adds. The presenter from Wageningen University in Holland, Alida Melses responses: “The study is a proof of principle – it doesn’t matter where you work as long as you demonstrate that it works. The area was chosen by practical reasons.” Alida Melse-Boonstra, Wageningen University, Netherlands, about improving nutrition through staple foods in Africa Kenya is a cassava consuming country, but in the area where the study was done, cassava would not be a staple food, continues Alida Melse. She thinks that the most important thing is that they could show an improvement of Vitamin A supply in the population by their intervention. This talk leaves behind baffled listeners, because a previous speaker in the same session was speaking convincingly about the importance of cultural diversity and consumer acceptability, which are often neglected from research. (read also Paulina's Blog) Cassava is an edible root crop and is a staple food for 70 million people in the world. It is extremely drought resistant, contains high amounts of carbohydrates and calcium, but spoils quickly after harvesting and one has either to eat or process it quickly. For the presented work with Improved Nutrition through Staple Foods in Africa (INSTAPA), 129 yellow varieties of cassava from Amazon were introduced to Kenya by IITA, Nigeria. The β-carotene content is particularly high in yellow cassava. The researchers analysed and selected the varieties performing best in β-carotene content. A Nigerian participant asked whether a farmer’s acceptance study was done, and what the results are. Apparently, the majority did like the new varieties. The yellow cassava would show an attractive colour, especially for children, a sweeter taste and a softer texture. 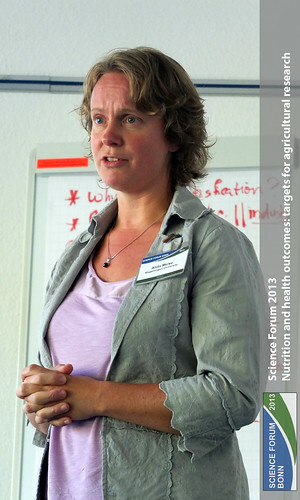 Alida Melse adds, that in Benin especially health behaviour identity, hence whether people were aware that Vitamin A is really important for their health, had impact on the level of acceptance. The trial included six servings of cassava in daily diets and increased Vitamin A intake by more than 60% of the daily requirements. The blowing away conclusion of the study: the daily consumption of yellow cassava increases Vitamin A intake and status and the yellow cassava trial had a high impact on β-carotene uptake of children. Furthermore, it was added by the presenter, that as this is a non-cassava eating population, replacement of staple foods by cassava would probably decrease intake of riboflavin, zinc, and other micro-nutrients, thus could lead to secondary deficiencies. Last but not least to the major question: How much cassava are children able to eat? According to the presented study, they could easily eat 400g of boiled cassava per day, which gives between 30-50% of the daily requirement in Vitamin A. Well that is great! Thank you dear researchers for your efforts – I am quite sure that meanwhile, the children in the study area have returned to their normal daily diets.